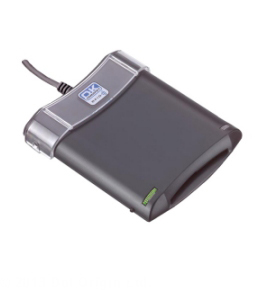 The Omnikey 5325 (previously the CardMan CM5325) is a USB 2.0 PC-linked reader that reads the unique serial number from HID Proximity cards (125 KHz) and reads/writes to virtually any contact smartcard. The dual interface feature economically supports end-user environments where both contactless and contact smartcard technology may be in use. The reader comes complete with WHQL approved Windows drivers, as well as support for other operating systems such as Linux. The CardMan 5325 is ISO 7816, PC/SC and EMV level one compliant and has a transmission speed to the card of up to 420 kbps. The housing design is optimized for advanced user convenience in contactless applications, and includes a transparent holder for keeping cards in place while in use. The Omnikey 5325 Prox is compatible with Read-a-Card, the contactless card ID reading application, useful for the integration of RFID technology into new or existing systems.